Important: Shaw T-180 Adhesive is the REQUIRED ADHESIVE for installation of Floorté® Pro Glue Down Attached Pad Products. Shaw T-180 Flooring Adhesive is a high-strength, high-tack adhesive for Shaw foam backed luxury vinyl plank over porous and non-porous substrates. Shaw T-180 offers extended open time, fast dry time and ease of application. This unique adhesive has outstanding water resistance and tenacious bond strength for demanding installations such as hospitals, schools, nursing homes,hospitality, and food preparation centers.The low odor is ideal for occupied buildings. One trowel used for most applications. This adhesive is covered by a 10 year limited warranty. 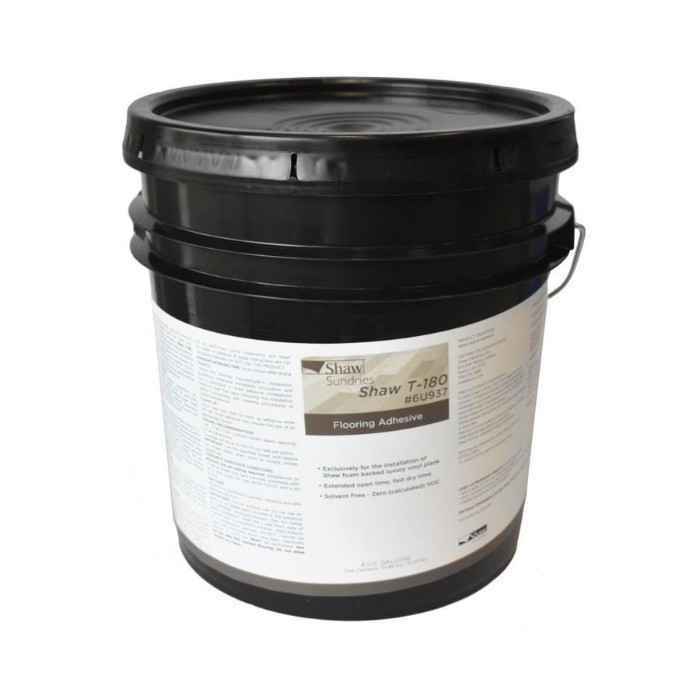 48 - 4 gallon pails per pallet. Polymer type: Acrylic Application:1/16” x 1/16”x 1/16” U-Notch (width, depth, spacing Color:White Shelf life: 1 year when stored in original packaging Storage conditions: 65°F to 95°F (18°C to 35°C). Do not allow Shaw T-180to freeze. Flashpoint (ASTM D56): > 212 deg. F. Protect from traffic: Immediate occupation and use is permitted in dried adhesive installations. Allow at least five days following the installation before conducting wet cleaning procedures or initial maintenance. Protect containers from freezing in transit and storage. Provide heated storage on site and deliver all materials at least 24 hours before work begins.